Dr. Sumeet Toshniwal is a Specialist Surgeon with a particular interest in abdominal surgery using open, laparoscopic and endoscopic techniques. He is a consultant surgeron in Eastern Health, Monash Health, and Knox Private Hospital in VIC. His patients are typically: General Surgical Patients, Acute Care Patients who wish to be treated privately, and patients needing Minor Surgical Procedures which can be treated in his rooms. 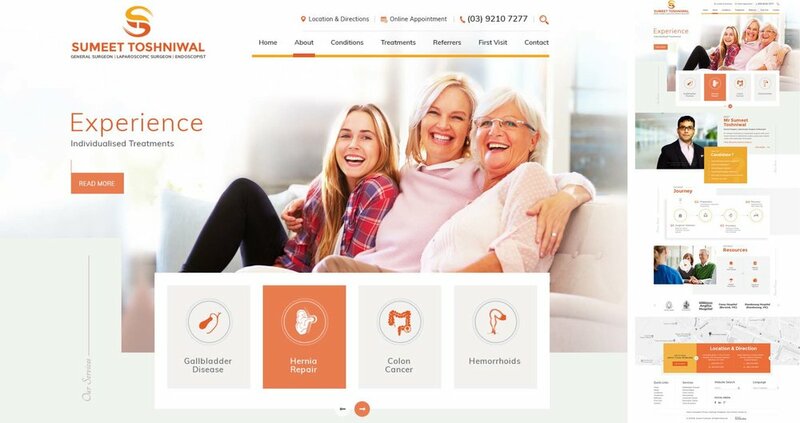 The purpose of the medical website design is to position and focus the website to cover the services offered and more effectively overview Mr Toshniwal’s expertise and credibility. The medical website design needs to be fresh, contemporary, clean, friendly, and professional. Uses edged-to-edge graphics, and have an uncluttered and consistent layout. The website design needs to reassure the visitor that Mr Toshniwal applies high levels of experience, technique, and knowledge when treating patients. Also, the website needs to reinforce the patient’s sense that there are clear treatment pathways.